Pumpkin is a classic flavor of fall. This Pumpkin Cheesecake Pie recipe is sponsored by OXO. Around this time of year, two types of people emerge: the Pumpkin Lovers and the Pumpkin Haters. Can you guess which category that I fall into? Yep, everything is better with pumpkin. I am actually not a fan of traditional cheesecake, but put pumpkin on top and the flavor takes cheesecake to a whole new level. A great finished product begins with the perfect kitchen tools. I’ve been using OXO in my kitchen for years. The products are durable and good quality. OXO has everything to put together a great pie, pumpkin or otherwise. For lattice pies, add the OXO Double Pastry Wheel and the OXO Silicone 1″ Pastry Brush to your kitchen tools. Precook the rolled pie crust according to the directions on the package or in your favorite recipe. 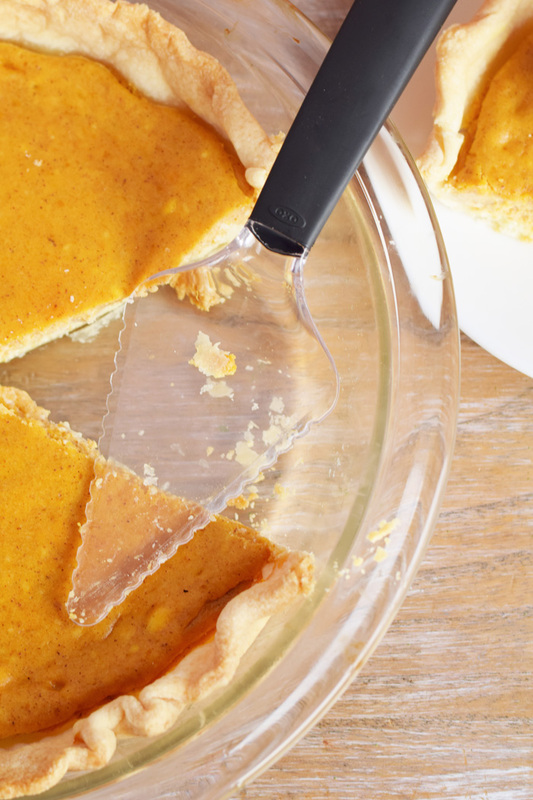 Bake it right in the OXO Glass 9″ Pie Plate. Meanwhile, soften the cream cheese. Pull out a OXO Good Grips mixing bowl and combine the sugar, vanilla, and softened cream cheese. Add the eggs and mix until smooth. Cover the bottom of the prepared pie crust with the mixture (approximately 1 cup or however much it takes to add a thin layer of cheesecake mixture to the bottom of the pie). 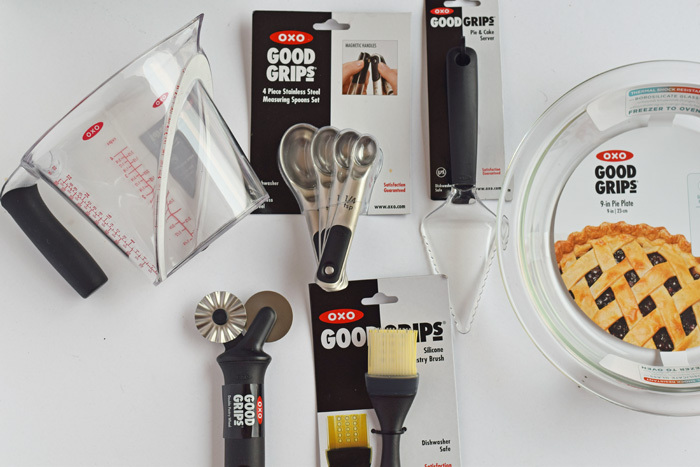 In another OXO Good Grips mixing bowl, combine the rest of the ingredients thoroughly. 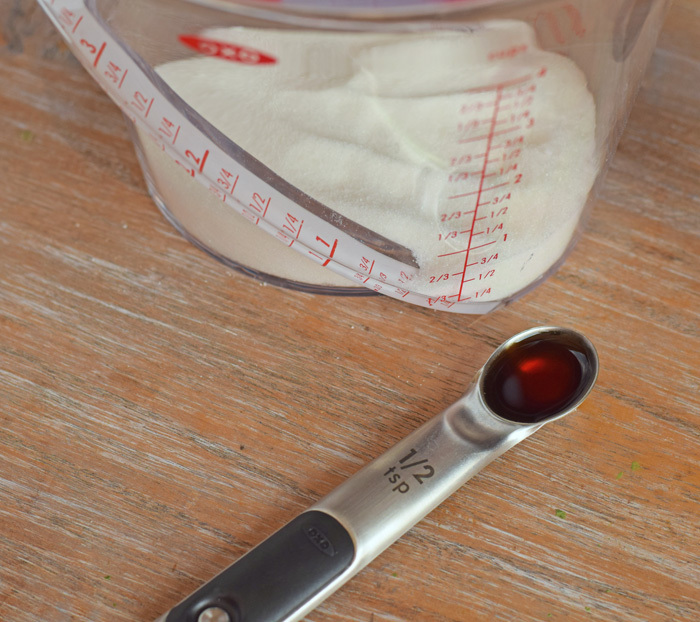 The OXO Stainless Steel Measuring Spoons and the 4-cup Angled Measuring Cup are helpful for measuring out all ingredients. Once finished, spread this over the layer that is already in the pie dish. Bake for 25-30 minutes in a 325 degree oven. After it has cooled completely, place it in the refrigerator for 4-6 hours prior to serving. The whipped topping is an awesome addition, but the pie is wonderful without it, too. Many of you know that my son is a cancer survivor, and organizations that support cancer research and treatment are special to me. This September is the Cookies for Kids’ Cancer 4th Annual 50 State Challenge in support of National Childhood Cancer Awareness Month. The goal of OXO is to inspire Cookies for Kids’ Cancer events to occur in all 50 states to promote childhood cancer awareness and raise funds for cancer research. If you decide to join the challenge and register online, OXO inspired events are eligible for matching funds from OXO. I used to make something similar for Thanksgiving every year. I’m not sure why I stopped, but this reminds me that this needs to be on the holiday table this year! Can I just drop by with a fork? LOL, I am definitely going to create this recipe, after all we love cheesecake and pumpkin pie. My youngest daughter is the chef in our home so I will have to share this recipe with her. 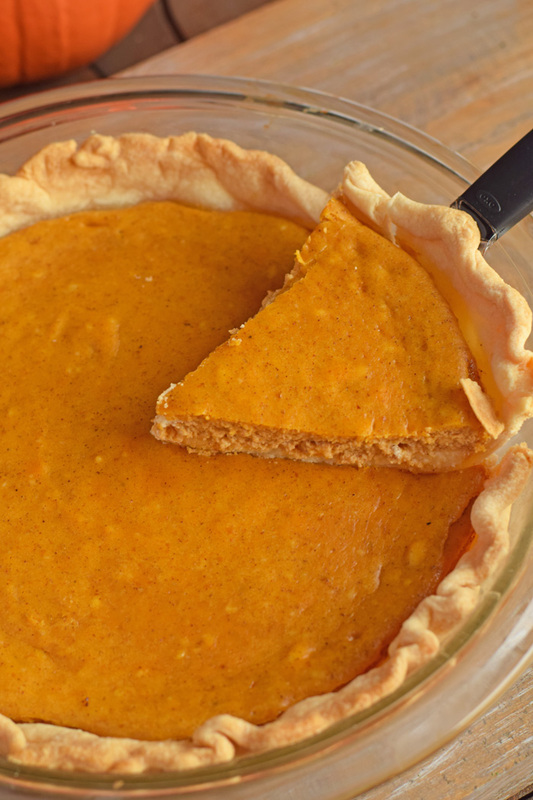 It’s the perfect pie for anytime of the year but, especially Fall season…thanks! Yum, Yum, Yum!! Oh yum! I am so ready for pumpkin season! I love all of the great fall recipes involving pumpkin. THis recipe looks super easy to make. I have made a lot of pies but never a pumpkin cheesecake. Need to try this one. Oh I’m so sorry to hear about your son with cancer. That’s never something a parent wants to hear and I hope he’s well in remission now. As for pumpkin pie, I am definitely not a hater, I think this world is a better place with pumpkin pie and whipped cream. That and warm apple pie with ice cream or peach cobbler. Oh gawd I’m getting fat just thinking about all the yummy goodness fall and winter bring. I need to start baking everything pumpkin and I also need your kitchen utensils. They look awesome. I am not a pie lover but this one looks really good. I love pumpkin scones and bread. Oh and coffee and drinks. I know my husband would love this pie. Damn I could have used that pastry wheel today. I was trying to make a baked apple dessert. The part that had the dough was hard to cut into squares. You must have been eavesdropping, I was just saying that I can not wait to eat something like this because I have been craving pumpkin everything. I love both cheesecake and pumpkin so this is for sure one of my favorites, weirdly enough I would also add some peanut butter for a total package, I may be the only one who feels that way though. I can smell the Autumn in the air. And the first thing that comes in my mind is Pumpkin season ! The color the smell and the taste of the pumpkin pie makes me happy. 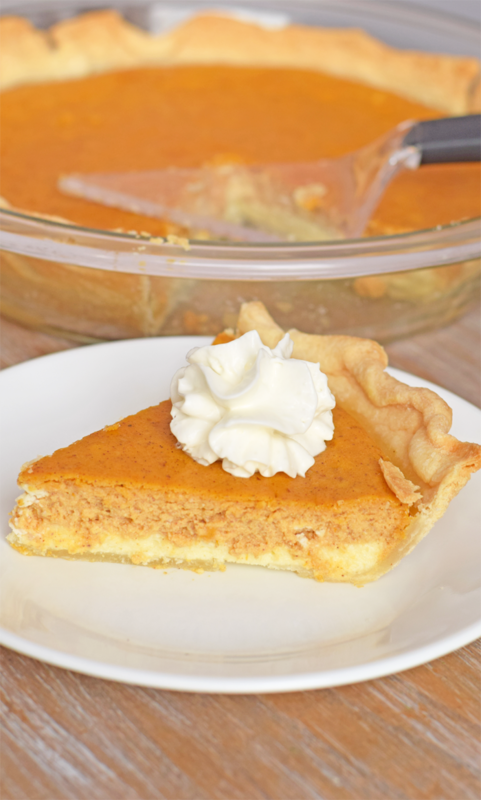 Thanks for sharing your homemade pumpkin pie recipe. A great addition for my recipe collection. Can’t wait to try it this weekend. OH my this looks so yummy. Pumpkin pie is my weakness. I haven’t made this version yet but now I want to try it out. 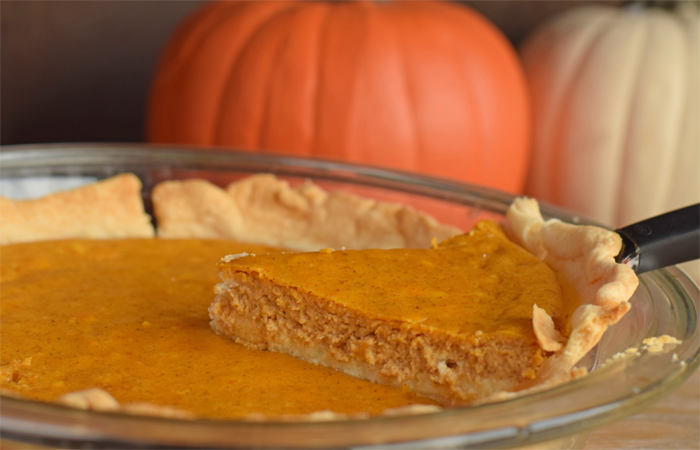 I love pumpkin anything and this pie sounds heavenly! This looks amazing, I love pumpkin and cheesecake so why not combine them! I have never tried OXO products, they look really nice. Looks like they have everything you need to make some delicious recipes. Pumpkin is hard to come by in where I live so whenever there’s a chance to get one, I make sure I do in a jiffy! Aaah… your pie looks absolutely delish! It’s so good that I hope to get my hands trying on making one soon. Thanks for the recipe!